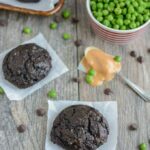 These gluten-free Chocolate Pea Cookies are packed full of a green vegetable and you’d never know it! They’re kid-friendly and make a great breakfast or healthy snack. 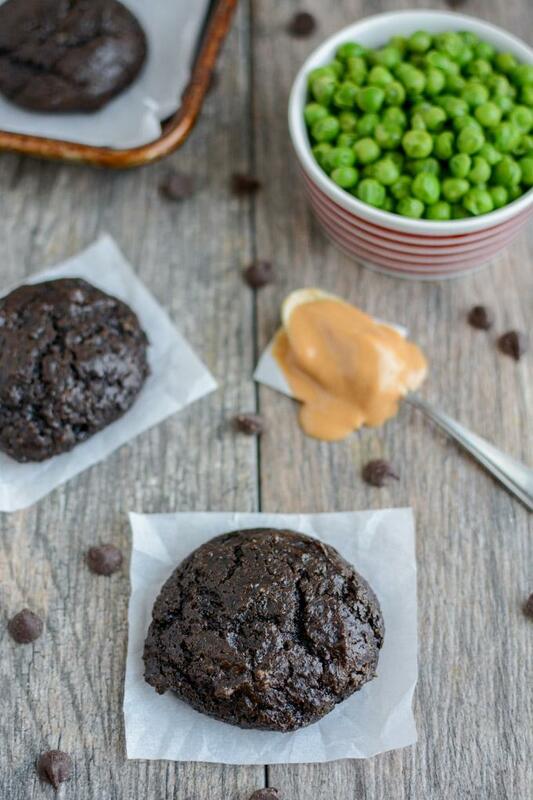 Allow me to introduce you to my latest invention – Chocolate Pea Cookies! So many of you loved my Carrot Oat Bars that it got me all excited and I wanted to come up with another new way to add some veggies to a baked good. 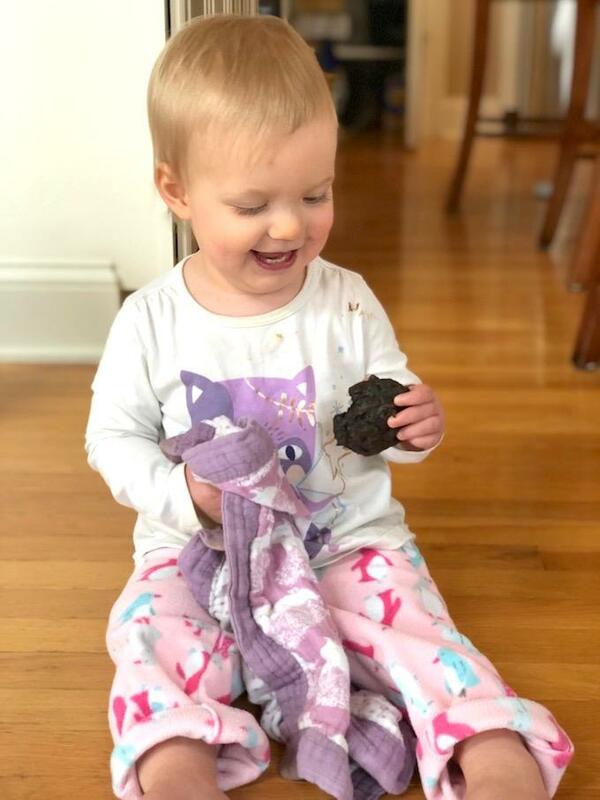 I know green can sometimes be a tricky color to get kids excited about, so I decided to depend on some cocoa powder and make a chocolate cookie. Then I snuck a full cup of sweet green peas into the recipes! I really had no idea how they were going to turn out, but much to my surprise, the recipe came out great! Little Miss has been gobbling these up for the past couple of weeks. And they’re so easy to make. Just steam the peas in the microwave whenever you have a minute and then when it’s time to bake, just dump everything in a food processor, whirl and scoop. These cookies are gluten-free and dairy-free (as long as you use dairy-free chocolate chips! I like Enjoy Life). They’re nice and fluffy and not too sweet. I use 1/4 cup sugar but if you’d like a slightly sweeter cookie you can increase to 1/3 cup. Be sure to let me know if you guys try these! I’d love to see pictures of you and your kiddos enjoying them! 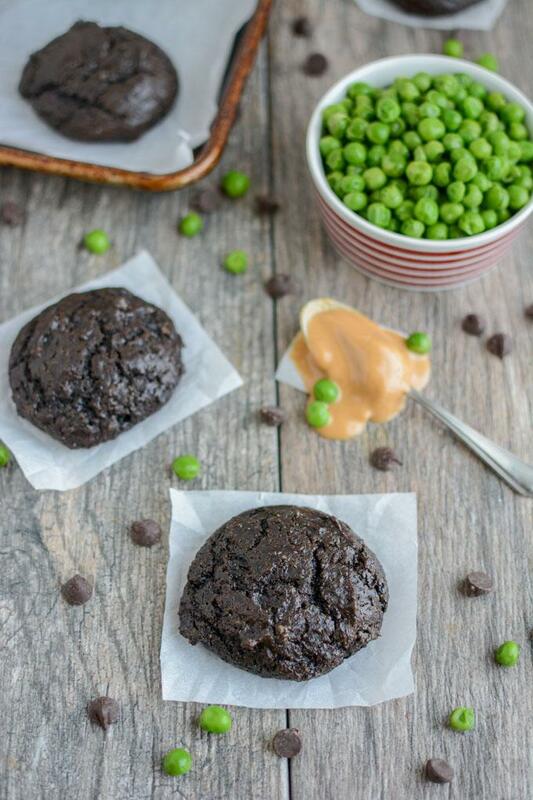 These healthy Chocolate Pea Cookies are packed full of a green vegetable and you’d never know it! They’re kid-friendly and make a great breakfast or snack. Add all ingredients except chocolate chips to a food processor. Process until smooth and well-blended. Scoop onto cookie sheets lined with parchment paper and bake at 375 degrees for 10 minutes. I make these with 1/4 cup sugar and they’re not overly sweet. If you’d like a slightly sweeter cookie I would use 1/3 cup sugar. What a great recipe! I can’t wait to try these tonight with my little guy. He is 2 1/2 and LOVES cooking with mom every day. Thank you for another great recipe, Lindsay! Is it possible to get nutrition stats? This is pure genius!! I love it. Perfect for kiddos who don’t do super great with veggies! Perfect for a little something sweet. Will be having these around a lot. My kid is allergic to eggs. Could I substitute applesauce or banana or something else for the eggs? I’m not sure. You could try a flax or chia egg and see how that went! Just made these cookies and they are so good!! Any chance to sneak some veggies in for my picky eater is a bonus! loved these thank you! The few tweaks that I made, used almond butter, and threw in a few fresh almonds, also used 2 tablespoons of honey, sweetened with a banana and a date. my kids loved these, even my pea hating child! Peas in a cookie, that is a first for me!! Made them yesterday, they are really good!! I like that they don’t taste crazy sweet. I even had my boyfriend (who is generally skeptical of “weird” baking creations) taste them and he definitely couldn’t detect that there were peas in the recipe. I used 1/2c peanut butter and 1/4c almond butter because that’s what I had, and Hershey’s special dark cocoa. Thanks! Made them exactly as written in the recipe and they were delicious! Wow, these are incredible! I used Hershey’s special dark cocoa powder and they taste like Devil’s food. Big hit with my kids! Have you ever made these with whole wheat flour and the dairy? I’m looking to add as many calories for my nephew who is a little under weight and brings a whole new meaning to “picky eater”! No, I’ve never made them with flour or added dairy. You could try adding some yogurt! These are delicious! Both my 4-year-old and 18-month-old gobbled them up. Definitely adding them to my regular menu.